The interesting thing about a lot of tribute albums is where the new artists take the songs. Donnie Fritts was a session musician for Kris Kristofferson for 40 years, and a pioneer in the music emerging from Muscle Shoals. JD Fox, or real name Jan De Vos, is a Belgian artist inspired by the roots music emerging from America, previously having recorded a tribute to Spooner Oldham, another pioneer from Alabama. The cross between Belgium and Muscle Shoals really does have the potential to be interesting, reinterpreting these classic American songs for a European audience perhaps not as familiar with the style as those growing up in the rural south. The record is certainly crafted with love, with a groovy backing well done using traditional instrumentation. Having said that, it does feel that JD’s vocals are separate from the backing, rather than being all part of a greater whole as often happens in live recordings. There are certainly highlights, such as the more full-sounding ‘’Choo Choo Train’’, but on the whole I would like to hear a bit more Rock ‘n Roll, a bit more Oomph in the recording, which unfortunately doesn’t happen throughout the record. It’s not bad, but it’s not as inspired as the songs deserve. 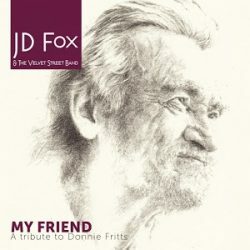 JD Fox & The Velvet Street Band bring together a collection of Donnie Fritts’ writing as a tribute to the Muscle Shoals Legend.